My Little Pony is one of the most colorful shows on TV, toys on the shelves and comics on the rack. So, of course, it might seem a little strange for the 2014 Funko My Little Pony Series 2 Mystery Minis figures to take on a mostly black color scheme. The lineup has ten different figures including two variants. 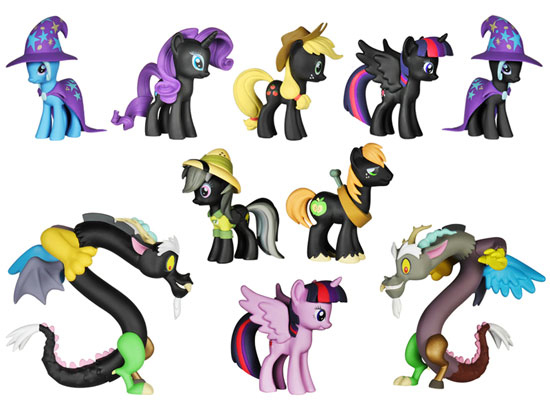 All but the variants have are almost entirely black save for their mane, tail, accessories and cutie marks. 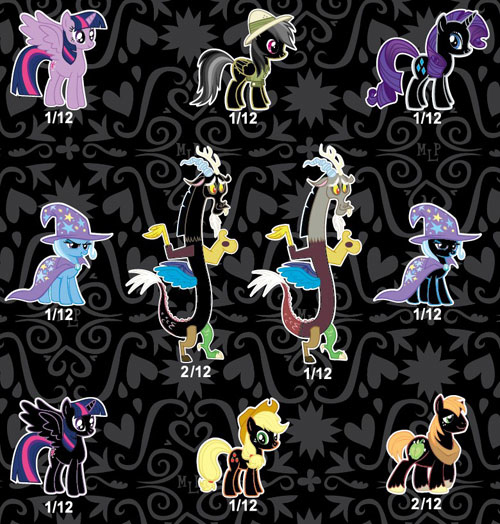 Twilight Sparkle, Trixie and Discord do have full-color versions as well. Although a couple of the 2014 Funko My Little Pony Series 2 Mystery Minis figures are more plentiful than others, none are incredibly tough to find. Big MacIntosh and the black Discord are 1:6 boxes. The rest are all 1:12. 2014 Funko My Little Pony Series 2 Mystery cases come with 12 boxes. Each box has one figure. They're sealed so you don't know which character you're getting until it's opened.